On our way back from Confession this morning, my husband and I passed by the area where Honolulu City Lights will be celebrated this evening. It is the annual event where the "Holiday" tree is lit, a parade goes through town and "Holiday" music is played. We were looking for the display that we knew the Knights of Columbus had put up. Here in our lovely city, there is a lottery for all groups to get a chance for their display to secure an area around Honolulu Hale (City Hall). It is not unusual to see a Buddhist display, the Families of Gays and Lesbian display and if a Christian group is lucky, a Christmas manger display. Tolerance and diversity is a big deal here in our island paradise. Well, we found a couple of Christian displays and then we spotted it...the Knights of Columbus' display. It looked so simply, white outlines of the Holy Family and the Three Wise Men, covered in tiny lights. Behind them a large white sign that stated very clearly...KEEP CHRIST IN CHRISTMAS. Tonight after dark falls, this will be a very beautiful and spectular scene to see...and in all its simplicity, it will speak volumes. I will post a photo later on. H/T to my dear mom. 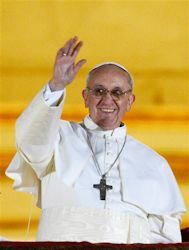 In his 1990 encyclical Redemptoris Missio, Pope John Paul II stressed the “urgency of missionary activity” by all members of the body of Christ, the Church. Not all of us are cut out for knocking on doors, and most of us feel unqualified to write books or give talks. But Christ’s great commission (Matthew 28:19-20) does not only refer to direct missionary activity. We witness the saving and sanctifying Gospel with what we do as well as what we say — including when we “give God permission,” as Blessed Mother Teresa of Calcutta often said, to convert our own hearts more deeply to Christ. 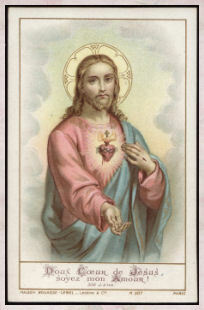 Sunday, Nov. 26, is the feast of Christ the King, an important solemnity. 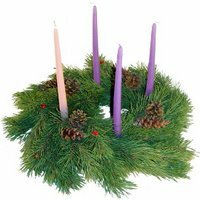 It falls one week from the start of Advent and 30 days prior to Christmas. For each of those days, here’s a simple way for you to evangelize, catechize and just say Yes to deeper personal conversion to Christ. 1 Pray every time a siren sounds. I recall my kindergarten teacher telling my class to do exactly this. I was surprised to find out later that this was once a common Catholic-school experience. I was once asked by a catechumen how many times Catholics pray per day. I told her that we should pray whenever someone needs our prayers and gave her the example of the sirens being a request for urgent prayers. I saw a light grow in her eyes as she thought about this concept. Even though she was baptized a long time ago, she reminds me from time to time about how she still prays for emergency victims and first responders. 2 Cross yourself when passing a church.A simple and ancient tradition. In many ways, it’s one of humility. I’ve frequently found myself avoiding crossing in public myself because I didn’t want to attract attention from strangers around me. Then I realized how powerful a witness a simple Sign of the Cross can be. 3 Say grace before meals — even in restaurants. Generally speaking, I take seriously Christ’s admonition about praying away from prying eyes (Matthew 6:6), but when one does so for the sake of others rather than for oneself, it seems like a gentle and efficacious means by which to evangelize. Like other overt public displays of piety, this can be a bit humbling but it is a magnificent opportunity to give to God that which is his (Matthew 22:16-22). 4 Place a cross or sacred-art item in every room. An old-fashioned act of piety? Sure. But one that, in our day of gadgets, electronics and conveniences, can stand out and make a powerful statement to others while providing a gentle reminder of God’s omnipresence to ourselves. 5 Have your house blessed. It’s a warm and comforting feeling to have one’s home blessed and dedicated. If your family doesn’t have a priest friend to do the honors, your parish can arrange for one to visit. 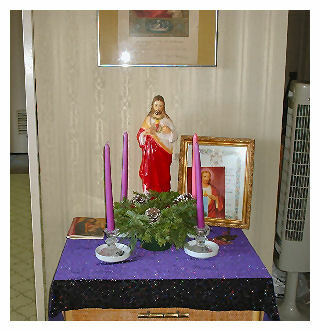 I prefer to have my home blessed twice a year, once during Advent and again at Lent. It allows me and my family to be mindful of the change of liturgical seasons and the sanctity of family life. 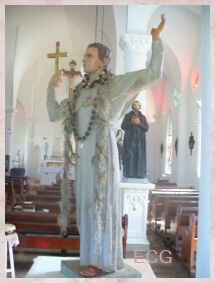 6 Know your saint. Having grown up in an Italian household, I was surprised to find that most of my fellow Catholics generally do not celebrate their onomastico, or “name saint day.” In a traditional Italian household, one’s onomastico was even more important than one’s birthday. 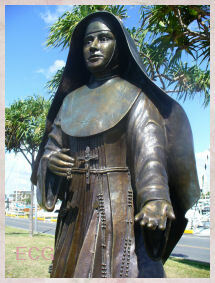 A little bit of research will turn up the feast days of every saint honored by a name in your family. 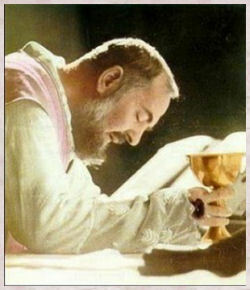 (Online, catholic-forum.com/saints is a good place to start.) Celebrate the family’s saints in a special way with a party that includes Mass attendance. Afterwards, ask the celebrant for a blessing for the children in your family. 7 Establish a family Rosary. As Holy Cross Father Patrick Peyton, the “Rosary priest,” said so often: “The family that prays together stays together.” A more beautiful way to bring prayer and the light of Christ to one’s family could scarcely be thought of. A family Rosary creates intimacy, humility, spiritual awareness and profound introspection — all things sorely missing in our daily lives and in society in general. 8 Stand up for the Church. When confronted by bigoted, closed-minded, anti-Christian opinions — a lot of those are going around today, aren’t they? — it is incumbent on us set the record straight. And to do it with love, respect and patience. 9 Live your life as if it were not your own — because it’s not. We, like all created beings and things in the universe, belong to God. Keeping this in mind, it is easy to understand the courage that our saints had as they lived their lives in Christ. Not everyone is courageous enough to seek out a martyr’s crown, but all of us should pray for the strength to be strong in the face of persecution from the unenlightened and unconverted. 10 Offer to pray for those in need. A Jewish friend of mine was surprised when I offered to pray for his ailing mother. Eventually, he thanked me. He came to understand that my faith was the standard by which I ordered my universe. It was an evangelizing moment for us both. 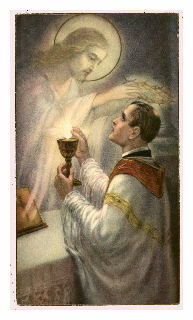 11 Receive the Eucharist frequently.John Paul II pointed out that the Blessed Sacrament contains in itself the “world’s principle and eternal source of salvation.” Participation in the celebration of the Eucharistic sacrifice is therefore the most effective missionary act in which the faithful can participate. We should avail ourselves of its benefits as often as possible. 12 Check the liturgical calendar every day. The Church measures time in terms of ecclesiastical seasons and individual feast days. Classic literature is replete with references to the uniquely Christian way time had been reckoned. It is a loss to our society that such references are uncommon outside of church, except for secularized references to St. Patrick’s Day, St. Valentine’s Day, Christmas and Easter. 13 Put up an Advent wreath. 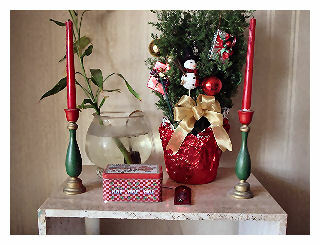 Lavishly decorate your home for Christmas and Easter. You’ll cheer the spirit and serve up inspiring symbols of our faith. One family of my acquaintance takes it upon themselves to create banners for Lent, Advent, Pentecost, Ash Wednesday, Mardi Gras, Corpus Christi and for the patronal saints of each member of the family. They hang them outside for all the world to see, and change them as the liturgical seasons progress. 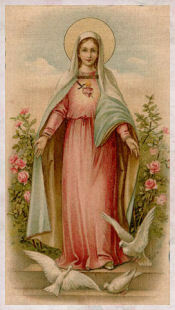 14 Keep your devotions to Mary, the saints and the angels. For millennia, Christians have had recourse to Mary’s intercession. 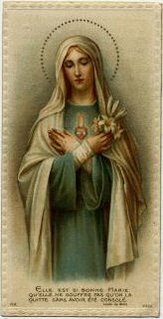 The Blessed Mother serves as the perfect model for all Christians, for women, for children, for teens, for mothers and for anyone who seeks to develop a Christ-centered life. 15 Join a prayer group or Bible study at your parish. All fellowship is local, and it’s highly motivating to meet other Catholics who are dealing with the same struggles, doubts, temptations and challenges as you. 16 Make a mezuzah. My observant Jewish friends are proud of their faith in God and in their identity as his children in some special, mysterious way. One outward sign of their faith is the use of the mezuzah (that’s Hebrew for “doorpost”), a small piece of parchment inscribed with several biblical passages (Deuteronomy 6:4-9, 11:13-21) and marked with the word Shaddai, an ancient name of God. The parchment is rolled up in the mezuzah and affixed to their doorposts. In imitation of this declaration of faith, many Christians similarly fashion their own Christian mezuzah. 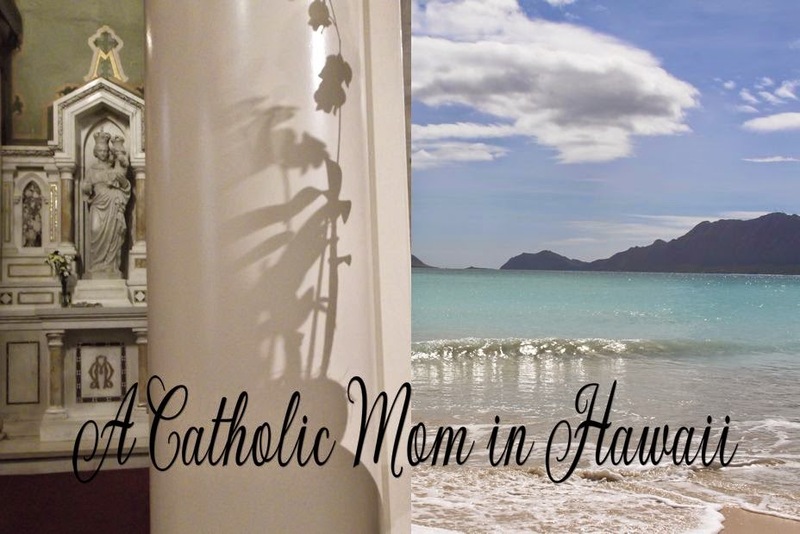 It can be as simple as an actual cross or crucifix or one fashioned from blessed palms. The point is to make a bold, anti-secular statement about one’s faith and one’s family and home. 17 Go ahead and preach it! The benefits of actively telling others about Christ — in a word, proselytizing — far outweigh the costs, which usually add up to nothing more than mild feelings of social discomfort. As long as it’s done with love and respect, you have little to lose and much to gain for Jesus. Trust in Christ and allow him to speak through you. 18 Take your family, or yourself, on retreat. As our lives become ever busier, it becomes all the more important to step back occasionally — once a year, at least — to recollect, remember and re-charge. 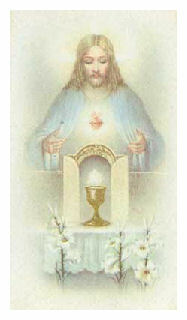 20 Adore Jesus in the Eucharist. What’s stopping you from spending some time in the presence of the Lord every day? Any tabernacle will do! 21 Volunteer. Faith without works is dead (James 2:26). It is useless to speak of prayer and one’s love of God if one is disinterested in human need. What more perfect way to let the world know that you are a follower of Christ than to love and care for those who cannot hope to repay you? 22 Let your light so shine before men … St. Francis is said to have told the first Franciscans: “Preach the Gospel always; when necessary, use words.” We can be the most eloquent and gifted preachers and apologists in the world, but the world will take note of how we live before it pays any heed to what we say. 23 Practice putting God first. In Luke 14:26, Jesus gives one of his hardest challenges to those who would follow him: “If anyone comes to me without hating his father and mother, wife and children, brothers and sisters, and even his own life, he cannot be my disciple.” In his wisdom, God knows that, by loving him above and beyond everyone and everything else in our lives, we will — paradoxically — be better able, not less so, to love the people he has placed in our lives. 24 Put up a lawn shrine. Sure, there are some tacky lawn shrines out there. But a tasteful Mary garden, well-tended all year, can speak volumes to passersby. 25 Create a prayer corner. For those of us who have the space in our homes, reserving a corner or an entire room for prayer and meditation is an excellent way to let Christ have a place of prominence in our homes and in our lives. And what a great place to show and explain to guests. 26 Eschew cultural corrosion. Support edifying art. Rent, buy or attend wholesome films — even when their production values aren’t up to the standards of Hollywood’s mega-budget productions. Tinseltown hears one thing loud and clear: the bottom line. Christians should be making their voices heard at the box office. 27 Seek spiritual direction. A magnificent resource we have as Catholics are the many nuns, monks and priests who serve the Church and, if approached, can be at our disposal to offer tailored spiritual advice. 28 Keep a prayer journal. Most of us are not blessed with such incredible memories that we can recall the progress we’ve made or the hindrances we’ve encountered as we develop in our spiritual lives over the years. That’s why it’s imperative to keep a record of our experiences in prayer and our personal thoughts about God. Your journal can become an invaluable resource as the years go by. 29 Celebrate Candlemas, not Groundhog Day. 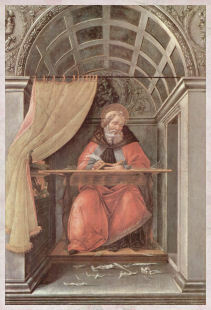 Until relatively recently, Candlemas marked the traditional end of Christmastide. I personally keep my Christmas decorations up until that day. If nothing else, I’m allowed the pleasure of seeing my decorations and have the opportunity to explain to curious passersby as to why they are still up. With all due respect to Punxsutawney Phil, the idea of prognosticating rodents is eerily pagan and has nothing to do with the originally Christian intention. 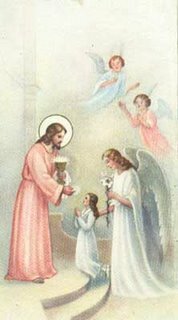 Feb. 2 had always been the day set aside by the Church to bless candles used in her liturgies. Let’s take back Candlemas from the secularists and use the day to bless the candles we use in our home — and wait until then to take down our Christmas decorations. 30 Abound in hope. Even in our weakness, the Holy Spirit helps us. Even in our spiritual confusion, when we do not know in what direction to turn, the Spirit himself intercedes for us with groans that words cannot express (Romans 8:26). If we willingly give up our access to God’s grace, if we do not reach out to accept God’s outstretched hand, we block him out of our lives. It is in our darkest hours of disappointment that God seeks to reach out to us. As Thomas Merton pointed out: “Prayer and love are learned in the hour when prayer becomes impossible and your heart has turned to stone.” Let love — i.e., God — rule! Angelo Stagnaro is a stage magician based in New York City. Never lie down to sleep without first having examined your conscience on the way you have spent the day and without first turning your thoughts to God. Then offer and consecrate your whole person and that of every Christian, especially my wretched self, to God just as I do for you (Letters II p 292). Per Christum Dominum nostrum. Amen. The following was complied by my friend Barb. 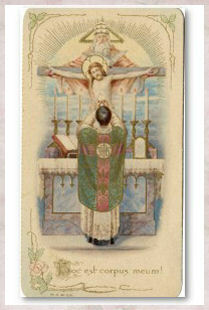 "O my beloved Christ, crucified by love . . . O Eternal Word, Word of my God, I want to spend my life in listening to You, to become wholly teachable that I may learn all from You. Then, through all nights, all voids, all helplessness, I want to gaze on You always and remain in Your great light. O my beloved Star, so fascinate me that I may not withdraw from Your radiance." AS WE CONSIDER OUR OWN. There is a little book I picked up from my bookshelf the other day. It was given to me by a friend in church a few years ago. 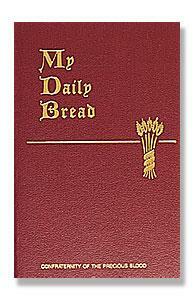 It is called My Daily Bread and published by the Confraternity of the Precious Blood. In some ways, it reminds me of the Imitation of Christ by Thomas a Kempis. The reason I like this little book is because no matter what page I turn to or choose at random, it usually strikes me as if speaking to me personally. It is structured in a way that if properly followed and with great resolve, we can overcome the faults that keep us from being saints. A Summary of the Spiritual Life, simplied and arranged for daily reading, reflection and prayer by Anthony J. Paone, S.J. published in 1954. In case you are interested, Leaflet Missal sells it. 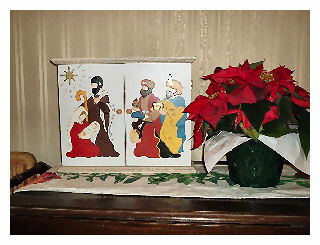 This is the little corner that we will prepare for the Nativity set. Right now it is cluttered with little Christmassy things and our fish. We want to place the emphasis this year, on the creche. As you can see, our tree will be a very small evergreen tree. This is the Advent Calendar corner. The Advent Calendar is actually a wooden box with individual little pull out drawers. Each one has been filled with a good deed, mortification or spiritual direction...and candy. We had placed the Advent wreath in our Sacred Heart Shrine. Our home was enthroned to the Sacred Heart of Jesus and I thought it only fitting to have the nightly Advent readings and prayers done here. Immaculate Virgin Mary, Mother of Our Lord Jesus, and our Mother! 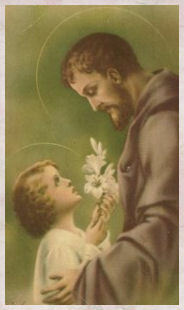 Filled wtih the most lively confidence in your all-powerful and never-failing intercession, I, your loving and trusting child, implore you to obtain for me the favor I earnestly ask, if it is beneficial to my immortal soul and the souls for whom I pray: (mention your request). Obtain for me a deep hatred of sin and that purity of heart which will unite me to God alone, so that my every thought, word and deed may tend to His greater glory. Amen. The United States is 85 percent Christian, which means we are more Christian than India is Hindu and Israel is Jewish. Moreover, 96 percent of Americans celebrate Christmas. So why do we have to tippy-toe around the religious meaning of Christmas every December? There is something sick about Friendship Trees, Winter Solstice Concerts, Holiday Parades and Holly Day Festivals. The neutering of Christmas extends to the banishment of Nativity Scenes from the public square, the expulsion of baby Jesus from crèches not otherwise forbidden, the banning of red and green at school functions, the censoring of “Silent Night” at municipal concerts, etc. All of this madness is done even though 97 percent of Americans say they are not offended by Christmas celebrations. So as not to be misunderstood, it is important to recognize that the few who are complaining do not belong to any one religious or ethnic group—there is plenty of diversity to be found among the ranks of the disaffected. No matter, fairness dictates that their intolerance should not trump the rights of the rest of us. Diversity means respect for the traditions and heritages of all groups, not just those which have been cherry-picked by the multicultural gurus. To be excluded is normal. Mother’s Day, Father’s Day, Veteran’s Day, Black History Month, Gay Pride Parades—they all exclude someone. The Olympic Games are a showcase of segregation—men are barred from women’s sports—yet not even radical feminists call it sexist. Should all of these holidays and events be banned because some feel excluded? By celebrating Christmas we are celebrating diversity. Don’t let the cultural fascists get their way this year. Faith is a path of illumination; it starts from the humility of acknowledging one's need of salvation and arrives at the personal encounter with Christ, who calls [one] to follow him on the way of love. Quote was shared by Sue. 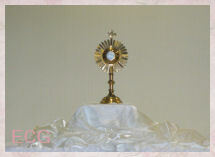 To make sure that we do not forget, Jesus gave us the Eucharist as a memorial of his love ... When you look at the Crucifix, you understand how much Jesus loved you then, when you look at the Sacred Host you understand how much Jesus loves you now. "...Blessed Mother Teresa of Calcutta. 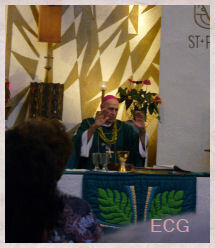 Picture courtesy of Catholic Digital Images and used with permission. Even though I clutch my blanket and growl when the alarm rings each morning, THANK YOU LORD, that I can hear. There are many who are deaf. Even though I keep my eyes tightly closed against the morning light as long as possible, THANK YOU LORD, That I can see. There are many who are blind. Even though I huddle in my bed and put off the effort of rising, THANK YOU, LORD, that I have the strength to rise. There are many who are bedridden and cannot walk. Even though the first hour of my day is hectic, when socks are lost, toast is burned and tempers are short, THANK YOU, LORD, for my family. There are many who are lonely and many who are homeless. Even though our breakfast table never looks like the pictures in magazines and the menu is at times unbalanced, THANK YOU, LORD for the food we have. There are millions who go hungry. Even though the routine of my work is often monotonous, THANK YOU, LORD, for the opportunity to work. There are may who have no job and many who are physically unable to work. Even though I grumble and bemoan my fate from day to day and wish my circumstances were not so modest, THANK YOU, LORD, for the gift of life. In the United States alone millions have been deprived of life by abortion before seeing the light of day, and day of birth. THANK YOU, LORD, for the fullness of true faith and for being surrounded by people of faith with the same Christian faith and moral values. Many are confused and have no idea of the extent of true faith and the divine Powers Jesus Christ gave to His Church which are present yet today, THANKSGIVING DAY. THANK YOU LORD. YES, EVERYDAY IS THANKSGIVING DAY. For every day in my parish church - there is offered the Holy Eucharist Sacrifice of the Mass - which perpetuates Calvary’s Sacrifice and brings me the Body, Blood, Soul and Divinity of my Lord and Savior, JESUS CHRIST. And so from the very beginning of Christianity the Fathers of the Church called what we do at and about the Catholic altar - the “Eucharist.” - EUCHARIST is a Greek word for THANKSGIVING. OUR LORD, JESUS CHRIST gave thanks as man to Our Heavenly Father - by His every act of worship and praise. The climatic act was His death on the Cross which redeemed the world. By it He re-opened the gates of heaven to mankind. The act of worship, of adoration of the Savior, - that offering of His death on the Cross - that was an INFINITE act of THANKSGIVING. Now in gratitude, Christ Jesus, God become Man, STILL willingly offers His Body, Blood and Soul back into the hands of the Father, thanking GOD THE FATHER for the privilege of taking on a human life and being able thereby to redeem mankind by having a human body to offer in Sacrifice. EVERYDAY IS THANKSGIVING DAY - for every day many THROUGHOUT THE WORLD participate daily in the Sacrifice of the Mass, in celebrating the Eucharist WHICH GIVES THANKS TO GOD, IN, WITH, AND THROUGH JESUS CHRIST. 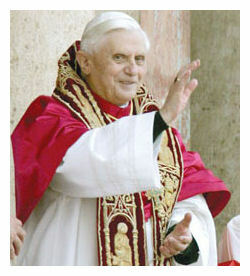 COUNTRIES - the gift of the Catholic Faith. THANK YOU LORD JESUS CHRIST - for now into my 52nd Year as a Catholic Priest - still to be able to offer EVERY DAY here at the Shrine of the Most Blessed Sacrament (Hanceville, Alabama) the Infinite Act of THANKSGIVING. EVERYDAY IS THANKSGIVING DAY. 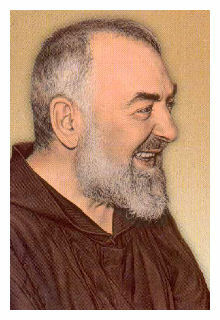 A blessed Thanksgiving - from FATHER ROBERT J. FOX and the FATIMA FAMILY APOSTOLATE INTERNATIONAL. Picture courtesy of My Favorite Pictures and the following was shared by Sue although I am not sure of the original source. My kingdom is not of this world. But yes, I am a king. to bear witness to the truth. The Evangelist Luke presents the Ascension of our Lord as the occasion when Christ was taken up to Heaven to the throne of God. His enthronement at the right hand of the Father in glory is the completion of the mysteries of His life and marks His inauguration as King of heaven and earth. 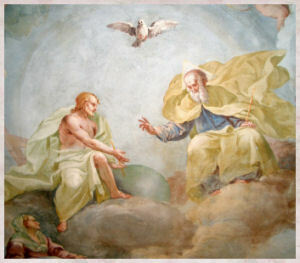 The Feast of the Ascension, then, for many centuries was the occasion when Christ's Kingship was celebrated. 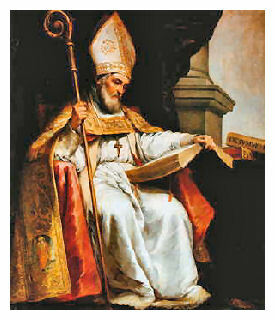 It remains today the major celebration of his victorious kingship. Only relatively recently, in 1925, was a second celebration of this mystery established by Pius XI under the title of Christ the King. While it is of lesser importance than the high Feast of the Ascension, it partakes of its dignity. in the face of this denial of God. What could have appeared a powerless gesture to the Church's enemies at that time now rather shows itself to have been a prophetic act. has remained integral with tradition throughout the centuries. Another intent in creating this feast was to counteract the strong current of secularism that has been so characteristic of our century. Resistance to this trend has proved less successful, however, and increasingly society in the West has taken on attitudes and practices that banish the sacred and the holy from daily life. Christ Himself made it clear that His kingship is not of this world. He is truly king of earth as well as of heaven, yet His manner of ruling is far different from that of earthly rulers. His authority derives from the Spirit and it is over hearts and minds that He rules, through faith, trust and love. His authority is at variance with the manner of the kings and rulers of nations. He came to serve, even to give His life for those over whom He would rule. He seeks nothing for Himself; rather it is for the good of his subjects that He is our leader, and for the glory of God, His Father. To take Christ as King is to model our selves on Him as well as to obey Him. Obeying our Lord by a deliberate choice. It is repeated daily in living out one's vows and commitments in life and is a high expression of the honor in which we hold Him. His values and aims are those we set for ourselves in life. Even more importantly, obedience is an act of love when it is given from the heart. By obeying we seek to please Him for His sake, in order to give Him glory and to further His cause. People who would become citizens of His Kingdom must be formed according to His teaching and example. and receive us into the mansions that the Lord Jesus goes to prepare for us. To serve Christ the King is to obey Him from the heart, and to obey Him from the heart is to grow in freedom and to realize our true independence from all that enslaves us in this life. Such obedience to His Word, His inspirations and to the teachings of His Church practiced in faith and with love is the best way to honor Christ as our King. As we commemorate His Kingship, let us resolve to pay Him the tribute of our free will and to make our life a constant service of His glory by obeying Him in all things and by cooperating with one another in carrying out His will day by day. Thus we shall witness to our society that Christ the King is the sole hero who can satisfy the human need for a model Whose life passes into ours and brings it to its proper completeness. The Feast of Christ the King was created by Pope Pius XI in 1925 to fix the way people were living like Jesus Christ didn't exist. 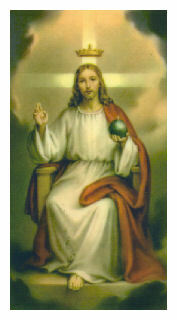 The feast proclaims how Jesus Christ is royalty above people, communities, nations, and governments. Christ's kingdom in heaven is or everybody who wants to be with Him, and it's endless. The feast establishes the titles for Christ's royalty over men: 1) Christ is God and holds high power over everything; 2) Christ is our Redeemer, He made us His by His blood and now we belong to Him; 3) Christ is Head of the Church, 4) God bestowed upon Christ the nations of the world as his special possession and dominion.